If Lexus wanted to convince us that it was neither boring nor unimaginative, the 2018 LC 500 is the car to do it. Born of a melodramatic concept, translated with painstaking care to mass production, and tasked with changing decades of preconceptions at a price that’s reasonably affordable, it’s no surprise that the LC doesn’t quite hit every note. Still, the delta between what this V8 GT promises and what it delivers is impressive. Few vehicles so cleanly capture “movie car comes to life” as the LC. Lexus’ original 2012 LF-LC concept was stunning, but nobody expected the production version to come anywhere close to the show vehicle. Turns out, we shouldn’t have doubted Lexus’ engineers. It’s a testament to the original design that, when the production LC was unveiled in January 2016, it proved to be just as jaw-dropping as the concept it was based on. Side by side there are certainly differences, but the huge, flared grille, Coke-bottle pinched waist, and outlandish proportions are enough to make this unlike anything else on the road. That it starts at a mere $92,000 is astonishing, though it has forced a few compromises to avoid a six-figure starting price. A lot of the exterior detailing – the blade-like rear lamps, for example – might look like metal but is, in fact, plastic. The design means that the trunk is tiny, too: 5.4 cubic feet. In an age where turbocharging is steadily replacing big, naturally-aspirated engines, the LC 500’s 5.0-liter V8 is a welcome change. It’s no stranger, either, being the growling heart of the GS F sports sedan, too. 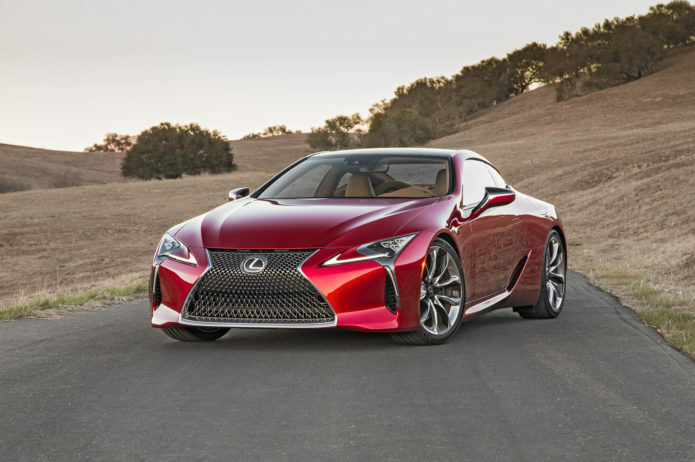 Here, Lexus has tuned it for 471 horsepower and 398 lb-ft. of torque. It’s paired with a 10-speed automatic, though not the dual-clutch transmission you might typically find in a modern GT. There are a lot of cogs, but in Sport and Sport+ mode at least the V8 is willing to spin all the way up to the 7,000 rpm redline, making a pleasing cacophony as it does so. Shifts are swifter than you might expect, though despite the noise there’s not the blistering performance you’d think would come with it. 0-60 mph comes in 4.4 seconds, and top speed is 168 mph. The LC 500 isn’t exactly light, though – curb weight is 4,280 pounds – and that can’t be entirely disguised in the corners. There’s some understeer, and the optional limited-slip differential isn’t enough to bypass the fact that this is a heavy rear-wheel drive car that at times runs into the laws of physics. Better, then, to drive this like a beefy grand tourer. Point the LC 500 at a turn, take advantage of the strong and fade-resistant brakes, coast around and then – with a snap or two of the meaty magnesium paddles – plant your right foot to pull you back up to speed. Just don’t get caught in a canyon battle with a Porsche 911. The LC 500 was the first evidence both that Lexus knew its previous cabin design and quality wasn’t quite what it needed to be, and more importantly that it knew how to fix it. A cocoon of leather and Alcantara, with lashings of carbon fiber trim, it’s a marked step up from most of the automaker’s other models. Only some plasticky buttons and trim on the steering wheel and in the center console let the side down. The seats are amply bolstered and nicely supportive, while the core controls fall to hand. A shame, then, that Lexus’ infotainment system feels so tired. There’s plenty of screen, with a 10.3-inch wide-aspect panel in the center console, but the Enform software lacks polish in comparison to what you’d find in other cars in the segment. No Apple CarPlay or Android Auto, just ugly graphics and Lexus’ Remote Touchpad with its clumsy navigation. It’s a real shame, as there are some glimmers of true thoughtfulness in the LC. Climate control that intelligently adjusts seat heating and cooling as well as the cabin temperature, for instance, or a voice command system that allows you to say “I’m hot” and have the settings adjusted accordingly. Problem is, eventually you need to dig into the UI, and it feels ten years behind what rivals are doing. The rear seats are child-sized, and better used for extra storage. Still, even with its dark leather, the LC 500 manages to feel impressively spacious as long as you’re in the front. Visibility is surprisingly good, and you don’t need to be a contortionist to get in and out without embarrassment. The Mark Levinson audio system may be a $1,220 option, but it definitely sounds the part. Despite what purists might claim, hybrid sports cars aren’t inherently A Blasphemous Thing. There are plenty of times, after all, when a jolt of instantaneously-delivered electric torque can be incredible: Acura’s NSX is evidence of that. Unfortunately, the experience on the LC’s hybrid version, the LC 500h which I also spent time with, is less compelling. Rather than a V8 you get a 3.5-liter V6, paired with dual electric motors and a lithium-ion battery. Joining the two is a strange transmission combination: a four-speed automatic, and an electronically-controlled CVT (continuously variable transmission) that pretend to be a 10-speed like in the LC 500. Sadly they don’t do a great job at that masquerade. It’s a similar setup to what Lexus has used in the hybrid model of the new LS, but while it suits the languid luxury sedan, it’s constantly wrong-footed in the LC 500h. There’s a frustrating uncertainty to the transmission: upshifting when you’d hope for down; unexpectedly holding low gears until you’re forced to change them yourself with the paddles. The CVT only adds to the unpredictability, wavering away in the background even though the gear position display suggests nothing has changed. Your ears start to doubt what your eyes are seeing and your body is feeling. I could almost forgive it, were it in the name of actually improving performance. Instead, it leaves the LC 500h a car you don’t particularly want to push hard, because it just isn’t close to being as rewarding as the V8 version (which is, ironically, a little cheaper too). Sport and Sport+ mode don’t help, only adding a frenetic edge to the overall experience. Even sticking with Comfort mode I got 22 mpg, short of the combined 30 mpg Lexus quotes. Leaving the LC 500h aside, does the 2018 Lexus LC 500 make sense? The movie star looks might leave you thinking this is a modern day rocket ship, but in reality it’s a grand tourer with serious growl, even if the performance doesn’t quite live up to the soundtrack. All the better, arguably, to bask in the dropped-jaw gazes from passers-by (not to mention leaving space for the LC F that Lexus is expected to make). What gives me pause is the cabin technology. It’s the most dated part of the LC 500 experience, and all the more jarring given the space-age design. I imagine, were this my 2+2 coupe, I’d get used to Enform’s foibles in time, but the knowledge that Mercedes, BMW, and Porsche drivers were enjoying much better systems would be a thorn in my side. Annoying, then, but not enough for me to discount the LC 500 entirely. Few cars have such allure to make you turn around as you leave them in the parking lot and simply marvel at the design. It’s a movie prop brought to life, and though it may not earn Lexus a clean sweep across all the awards categories, the automaker deserves serious kudos for bringing a concept so cleanly to the road.